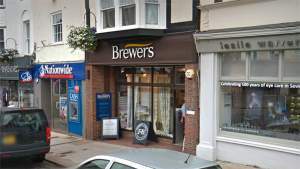 Brewers is the prime supplier of paints, decorating equipment, wallpaper and soft furnishings in Sevenoaks, Kent. We offer a personalised service, can source any products through the Brewers network plus one of our team in particular is known for her expert colour matching. As well as what’s in store, visitors can explore the full range of wallpaper and designer paints online from a customer internet terminal. If you have children with you, we have a kids’ area to keep them safe and occupied. You’ll find us on Sevenoaks High Street, next door to Nationwide and almost directly opposite Lloyds Bank. There’s pay and display parking directly in front of our store, so loading up with stock is simple. From Pembroke Road, turn right on to the High Street. The store is on the left side just before reaching the end of the road. Travelling from Tonbridge Road, continue on to the High Street. Where the road splits, turn right and the store is a short way along on the right. Travelling from the A225 Dartford Road, continue on to the High Street. The store is on the left side just before reaching the end of the road.